Our toner is and will always be alcohol free. Alcohol free toner is so important to your skin. If your skin is prone to wrinkles, acne, oily skin or dry skin you should stop using alcohol in your skin care and make up products. Alcohol is placed in most of the skin care and make up product lines to extend their shelf life. That can’t be good for us. Alcohol is an agent that dries our skin out. Alcohol is irritating and can cause inflammation. Why should we put it on our body? We shouldn’t. It is thought to rob our skin of their natural oils and thus causing your face to then overproduce more oil. I thought I was getting rid of oil by using my alcohol based toner. Turns out, not so much. What should my skin care regime look like? You should cleanse your face twice a day. Once you’ve cleansed it then apply your toner. After your toner make sure to use a moisturizer to seal the moisture into your skin. You may now apply light make up and carry on with your day. In this case more washing and cleaning is not better. Make sure you only clean your face in the morning and right before bed. If you do it more than that you could irritate your skin and make whatever skin condition you might have worse. 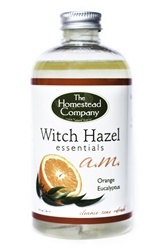 Our alcohol free witch hazel makes a great toner or astringent. It’s going to give you that fresh face feeling without any of the drying, irritating or inflaming of the skin. So check us out and see if you don’t agree. Our toner will help your skin and give you a nice clean feeling.